T-Bone is a 3-year old American Bulldog Mix or Pit Bull (his origin is uncertain) that was recently rescued by a client. However, to her dismay our client found that T-Bone jumped on her frequently during greeting, pulled on-leash, mouthed her hands, didn’t know obedience commands, and obsessively mounted dog playmates. T-Bone is friendly to man and animal. Nevertheless, his high energy level and his lack of impulse control reduced the pleasure that our client received from his company. In addition, some dogs took umbrage to his mounting behavior. To compound the difficulty in designing his lesson plan, T-Bone is deaf. Therefore, due to a busy work schedule and the complexity of his training, our client opted for CPT’s board training program. To compensate for T-Bone’s hearing impairment it is essential that we start the board training process with relationship building. Before we commence intense training, we need T-Bone to trust the trainer, to feel secure amidst the trainer, and to receive indisputable enjoyment from playtime and sustenance activities with the trainer. Then, once a bond develops, we concentrate on focused attention training. 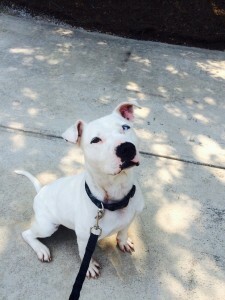 The attention process is different with a deaf dog than for a sensory-able dog. With a normal hearing dog we likely would use a clicker to teach focused attention. However, the auditory stimulus of the clicker is imperceptible to T-Bone. Consequently, we may initially use the olfactory stimulus of food, tactile stimulation (touch), or a visual stimulus (a preliminary movement or hand signal) to attract his attention. Subsequently, whenever T-Bone responds with focused attention, either post the onset of the cue stimulus or spontaneously, we will reward him with praise and a treat. Even though he can’t hear the praise, he can see the human smile that accompanies the praise. Moreover, by praising the trainer is more likely to naturally smile when delivering the treat. Next, once T-Bone establishes a mutually productive rapport with the trainer and spontaneously remains highly attentive without a large amount of extrinsic aid, we progress to teaching him obedience commands. With most board train dogs we emphasize verbal commands. However, since T-Bone is deaf, we will exclusively use hand signals. Initially, we will introduce the hand signal in close proximity and in conjunction with a physical prompt that facilitates the correct behavior. For instance, with Sit we will place a treat from his nose to behind his head so that he naturally sits when following the food with his eyes. We will then praise and treat him once he completes the desired behavior. Once he is proficient with the trainer proximal, we will hide the treat and use it as a reward, as opposed to a lure, we will move progressively more distant from T-Bone, and we will highlight the hand signal movement as the germane stimulus. The Sit hand signal is usually the right hand moving in a sweeping movement that starts downward, swings upward, and ends in a right angle with the palm facing the dog, the forearm vertical, and the upper arm horizontal. Optimally, we hope that T-Bone will sit reliably and responsively when seeing the signal from a distance as great as 50 feet. With Down, we first use a pointing left hand signal with a treat in the left hand. We may also move the treat underneath T-Bone’s chest, which facilitates a lowering of the head, a relaxation of verterbral musculature, contraction of the elbow, and rotation of the hip, which in turn produces a reclined position. Once T-Bone is fully down, with his elbows touching the ground, we will praise and deliver the treat. Next, we add a conjoined signal with the right hand that immediately precedes the left hand signal, where the right hand and arm point outward and toward T-Bone in a slightly raised European salute. Once T-Bone appears to recognize the right hand/arm signal we wean the left hand signal. We need to replace the downward pointing signal with the upward signal, since the upward signal is easier to see at a distance. Then, when T-Bone is proficient up close with the right hand signal, we gradually add distance until T-Bone is competent from a distance of 50 feet. With Come we use a right hand signal where the the right arm starts extended horizontal to the ground. Then, the palm moves inward to touch the handler’s chest, whereby in the final position the entire forearm is parallel to the ground and across the handler’s body. We start with the leash in the left hand and a treat in the right hand. We show the treat and deliver the signal while happily running backward. We will then praise and treat when T-Bone follows us. If T-Bone is confused, we may use light pressure on the leash to educate him regarding the proper movement. Once T-Bone is proficient with us starting next to him, we will add distance, we will wean the treat as a lure, but it will still be used as a reward for exemplary performance, and we will wean running backward as a physical lure. As we add distance, we may also add a long line to help T-bone to succeed during the more difficult stages. Once T-Bone is reliable and responsive from a distance of 50-feet, we then start close again, albeit in a distracting environment. During the last step we add distance amidst the distracting environment. With Walk, we use a hand signal where the left hand moves from a downward position, alongside the body of the handler, to a 90 degree position aimed forward. In essence, the Walk hand signal points the dog forward. We may start with a treat in the hand to encourage T-Bone to follow. We will initially keep the treat in view (about hip high) to encourage proper heel position (where his right shoulder is even iwth the handler’s left leg). We will reward with the treat whenever T-Bone remains in position and delivers upward attention. We will implement minor response blocking corrections with the leash/collar whenever T-Bone moves outside of heel position. Once T-Bone is proficient, we will move the treat from a lure to a reward and we will require that he provide attention for a progressively longer duration before receiving a food reward. We will introduce Sit-Stay once T-Bone is competent in the Sit behavior and Down-Stay once T-Bone is competent in the Down behavior. However, if T-Bone exhibits significant inhibitory control issues we may start his Stay training earlier, once he is proficient with each command from a proximal distance. The Stay hand signal is the left hand, palm down, parallel to the ground, sweeping toward the dog’s face about 1 to 2 feet above the dog’s eyes. We start Stay training on leash, where we use prompt leash response blocking to communicate error. We start close, for a short duration, in a low distraction environment. Once we reach the target duration (we usually start at 5 seconds and then gradually progress to a 3 – 5 minute maximum time, where the target time is always randomized), we communicate a Release signal. The Release signal is usually both arms flapping upward with or without the trainer touching the dog. We then play with the dog. We may also give treats before releasing for play or immediately after the signal, but before play. Once T-Bone can stay reliably for several minutes with the trainer close we will commence the same progression in a distracting environment. Once T-Bone is proficient up close for several minutes with distractions we will add distance, first in a low distraction environment and then in progressively more difficult environments. For safety reasons, we will also add a long line when training distance stays. T-Bone board training with CPT Trainer Megan Sinteff Jefferson. Gotta love those eyes! With all exercises, we will progress from a constant reinforcement schedule (CRF) to a diminishing frequency random reinforcement schedule attached to standards. Diminishing frequency means fewer treats as a percentage of overall repetitions and as a percentage of successful repetitions. Standards means that the dog must meet increasingly more stringent standards to earn a treat reward. Random means that not only will the treat rewards be consistently attached to standards that require superlative behavior, but as the dog improves he will need to be successful for a longer period before receiving a treat reward and we will deliver the treat in a non-predictable random pattern that diminishes in frequency. The goal is to produce a dog that understands all the behaviors, that is intrinsically motivated to perform the behaviors, and that will cooperatively, reliably, and responsively perform all the behaviors in practical circumstances where the handler may not possess food. We wish a dog that is sufficiently motivated by the activity itself, the opportunity to work cooperatively with the handler, and by praise. Nevertheless, to accomplish all long-term goals takes time. The time period required to achieve goals will depend upon the number of behaviors within a client’s lesson plan, the complexity of the behaviors, the temperament of the dog, and the aptitude of the dog. Yet, so far T-Bone has been highly cooperative and participative. Therefore, we are optimistic. 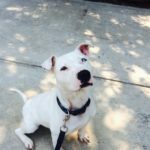 If you have a deaf dog, we hope that you found the above information beneficial. In addition, if you would like professional consultation when training your dog, you may wish to consider CPT’s private, in-home private, or remote private training programs. If you have progressed satisfactorily in a pristine or private setting, then you may wish to proof your deaf dog while professionally supervised within a CPT group class. 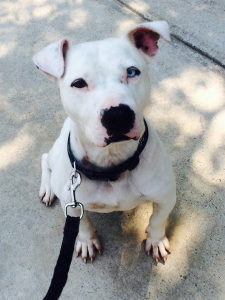 Please note that we do not recommend commencing the training of a deaf dog within a group environment. Because of the requirement for high-level attention, we strongly recommend starting the dog’s training program in a non-distraction setting. And if you would rather assign all of your dog’s training to professionals, especially during the more complex incipient training stages, you may wish to consider CPT’s board train program, as did T-Bone’s owner. T-Bone is presently in board training with CPT Trainer Megan Sinteff Jefferson in Flowery Branch, GA.
For more information about CPT’s programs, please contact the CPT office by email or by phone (404-236-2150).